The rest of the developed world has left us in the dust since we enacted the Family and Medical Leave Act in 1993. Twenty years ago today, the US passed the Family and Medical Leave Act, finally codifying into law the right for most employees to take time off from work for the birth of a baby or to care for a seriously ill family member. Since then, workers have used it 100 million times to care for themselves and their families. But this milestone, and all the good it’s done since, hasn’t been enough. We’ve fallen behind our industrialized peers on many key indicators since then. Only about 60 percent of workers have access to paid leave, putting a huge financial burden on new parents and those with sick family members. Our failure hits working families square on. But it’s a problem we all bear, because it’s also threatening our economic edge. Yet even unpaid leave isn’t going far enough. About forty percent of workers aren’t eligible for FMLA leave. The Department of Labor just released new numbers on the FMLA, finding that nearly five percent of all workers needed to take leave and couldn’t, and over six percent had an unmet need for leave in the past 18 months. Those numbers have gotten worse since the 1990s: in 1995 just half that number needed leave but couldn’t take it in the previous 18 months. It’s worst for low-income workers: 8.2 percent of those who make less than $35,000 a year versus 3.4 percent of those who make over $75,000. Of those who couldn’t take leave, nearly half said it was because they couldn’t afford it. No wonder, when half of all leave takers are either paid only part of their normal wages or nothing at all. Those numbers are again greater for low-income families. We also know that those who do take unpaid or partially paid leave struggle to make ends meet. The DOL reports that 30 percent borrowed money to get by during leave, more than 35 percent dipped into savings meant for something else, the same number put off paying bills, 85 percent had to limit spending and, most disturbing, almost 15 percent went on public assistance. That last figure has almost doubled over the past ten years. These problems have had a huge effect on our economy, specifically on women’s share of the workforce. After growing rapidly since the 1970s, women’s participation rate in the labor force started to flat line in the '90s. It was 74 percent in 1990 and has only grown to 75.2 since then. Turns out, though, that this makes us an outlier. In that same time period, other developed countries kept growing their share of women in the workforce. Twenty-one others shot up from an average of 67 percent to nearly 80. That means that while we used to rank at number six, we’ve sunk to number 17. Paid family leave figures prominently when you look at the causes of these declining numbers. We enacted unpaid leave in the ‘90s, but since then other countries have mandated paid leave that’s longer than 12 weeks and have kept expanding it. If the US had kept up with the times and mandated paid leave, while adding in other policies like protections for part-time work and increased spending on child care, women’s share of the labor force would be at 82 percent, bumping us up to number 11. The lack of these policies accounts for nearly 30 percent in the deterioration of women’s participation rates. Before you think this is only problematic for a certain group of workers, remember that women’s entrance into the workforce since the 1970s accounts for a quarter of our GDP. Think about how much higher that would be if they’d kept making gains. 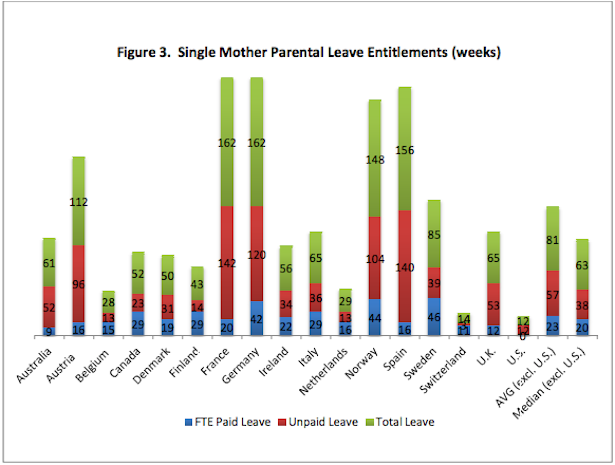 We are among just three countries out of 178 that don’t guarantee paid maternity leave. Being a mother and a worker shouldn’t be such a contradiction. The FMLA was vitally important, as the hundreds of millions of families who have used it can attest. But it’s clear that we’ve allowed ourselves to get left behind since then. Twenty years later, it’s time to update our policies so they look like we live in the 21st century. For more on the plight of America's least well-off, check out Greg Kaufmann's blog.